A note-card ready to be made into a focus of ultimate power, created by Paul. Traits: All rituals that result in the creation of focuses require absolute faith in the respective religion or god3 and an item to focus the power in. Generally, these items hold importance within these religions, such as the Christian Cross or a Jedi Lightsaber. The performer of the ritual must also keep focus on the item at all times throughout the ritual, or risk failure. The specifics of the ritual must be defined by religious text and is generally passed down through 3 generations before being lost.4 There must be a great sacrifice made, which is generally defined as the closest loved one or an object with overwhelming sentimental value. Failure to follow all of the above and attempting the ritual anyway, or substituting materials in said ritual, will result in either the creation of a "world-breaking object"56 or the death of all life in the immediate area. Nature: These rituals generally create these focuses of power by either imbuing them with a manifestation of the performer's absolute faith or by the head god of the religion blessing the object with some of their power. Focuses of power are also generally too powerful to be handled by those not strong-willed, or must be handled in parts and in unison.7It should also be noted that the definition of ultimate power varies, however the consequences of failing the ritual are constant and well documented. Various examples of manifestations of power are listed in the below History section, while any failure so far has resulted in all participants of the ritual dissolving into ash. History & Associated Parties: The first ritual to originate around the creation of focuses of ultimate power came from the Greeks, whose cults would often attempt to have the Greek gods imbue various items with power. They only came across a ritual to gain ultimate power accidentally when one cult met the aforementioned conditions when attempting to enchant a vase. That said, soon after all members of the cult dissolved when unable to handle the mighty power imbued within the vase.89 Over time other cults and religions have rediscovered the base ritual to focus ultimate power, manifesting into items such as a ceramic teapot containing a spirit, a vial of water that cleansed all it touched, a fountain that reverses age, a legendary sword whose power only manifested for the true king of England10, a stopwatch that controlled time, a microphone that allows the user to speak things into existence, and most notably in recent times, a note-card. 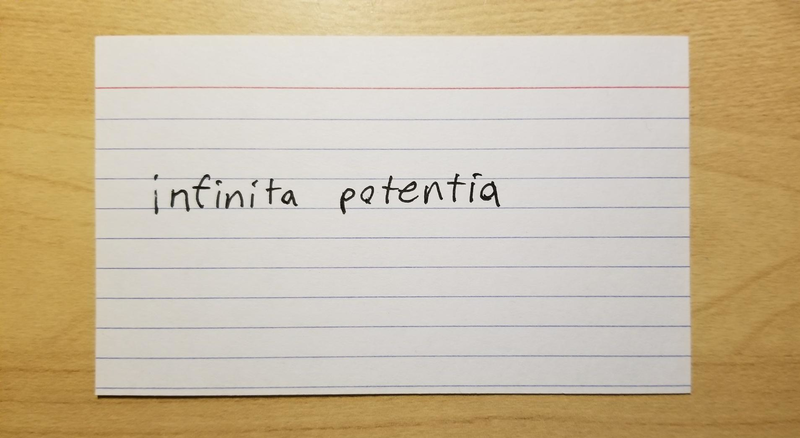 The note-card was an attempt by a resident of the Library 5 years back, who created a religion for the express purpose of focusing ultimate power, and disappeared after focusing the power into a note-card, prompting the name of note-card of unlimited potential. Other Detail: The ritual, contrary to popular belief, does not have to be complicated in the slightest. The resident from the Library simply shouted his name 5 times while focusing on his attention on the soon-to-be note-card of ultimate potential.1920 Although he vanished after the event, we can assume that he was successful, as his ashes (if he failed) were nowhere to be seen. Complexity of rituals does tend to help focus the individual and ensure absolute faith, which is likely why rituals of established cults and religions tend to be over-complicated. "… let all of your followers make a tremendous din, and the winner of the race be the one to focus Pan's power… let him perform the most maniacal dance and focus his mind fully onto the lute, and his power shall be yours." - A recovered passage from a ritual book of a Greek cult who worshiped Pan, circa 250 B.C. "Yeah, I remember Carl. He was a bit of a nut, was always obsessed with making the next Excalibur, or as he liked to call it, "an item of unlimited power". He created his own religion, based on worshipping himself, called it Carlism. He set it up with an official document and everything, a religion of one person, for one person, being himself. I helped him write up the ritual for ultimate power too, he wanted to kill off some Library members and draw a circle with his face inside, but I reminded him it didn't need to be complicated (and I didn't want to be involved with the murder of my friends and fellow Library members). And so, the ritual was he had to shout his name at the top of his lungs 5 times while focusing on a note-card that had some Latin written on it, with the goal being a note-card that would let him reach peak Carlinity. The day comes, and after he stuffs a full Monty down his throat and made his sacrifice21, I'm looking over some old ritual stuff and all of a sudden hear his name shouted 5 times. Moment I turn around, it's like I get flash banged, and Carl's gone. I hope the old guy got his note-card of ultimate potential or whatever, and I wonder what it does." There is some debate on whether or not Carl actually succeeded in his attempt to create the note-card of unlimited potential, as he disappeared in a literal flash along with it. Some say that the truth is that he was the first to experience the consequence of creating a world-breaking object, although it cannot be confirmed, nor can the definition of such an object be obtained, since no-one has ever created one before. All previous rituals have either succeeded or dissolved all participants into a pile of ash. The creation of a world-breaking object is only referenced in out-dated Catholic rituals, and even then there is no evidence that one was ever made. 1. Isn't it a rather dangerous idea to provide this tutorial? B.N. 2. Oh relax, no-one's successfully done so in ages, and the only guy who did succeed disappeared. F.L. 3. Even if that religion has been completely made up very recently F.L. 4. This is the average time it takes, and of course only for the rituals we know about. Who knows how long the Catholic Church or some Orthodox Jews have kept around their rituals… F.L. 5. So what does actually look like? A world-breaking object that is? Like what, literally crack the Earth in half? B.N. 6. Seeing as no one has had the bad luck of creating one, I really cannot say. Perhaps the bending or removal of fundamental concepts like perception or gravity. Or maybe everything turns blue. I have no real idea. F.L. 7. But I mean, as long as you follow every single minute and specific detail, you'll have ultimate power! B.N. 8. Really? A vase? B.N. 9. So the legend goes… apparently lent by a wife of a titan F.L. 10. Funny part is that it hasn't manifested its power for centuries B.N. 11. Like your wife. Or your family sword passed down through the generations. Or your Playstation 4 I dunno. B.N. 12. I sincerely doubt anyone's most prized and sentimental possession is a Playstation 4 F.L. 13. I wouldn't be surprised. Have you seen some of these comments on Youtube? or VidShare? or any other dimensional equivalent of Youtube? B.N. 15. Including a PS4? B.N. 16. I….. yes, including a PS4. F.L. 17. Great, I've always wanted to hack the world with a PS4. You remember how they made supercomputers with those? Now I can just use one! That hacks the universe! B.N. 18. You're not even wrong and that's terrifying. F.L. 19. After burning his best friend alive. B.N. 20. Yes. That was his sacrifice. F.L. 21. It should be noted that Paul did not know what the sacrifice was. F.L.